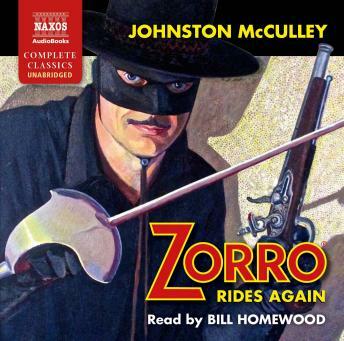 Zorro Rides Again is the third novella featuring Zorro, the Robin Hood of Old California. Reina de los Angeles is being terrorized by a masked swordsman who marks the faces of his victims with Zorro's trademark Z. But is this the real Zorro? The Governor of California offers a reward for the capture of Don Diego Vega (who is known to have previously been Zorro) dead or alive, while an army - led by the ruthless Captain Rocha - is in hot pursuit of the outlaw. Assisted by a coterie of allies and the native Cocopah tribe, Don Diego seeks to establish his innocence and unmask the evil imposter.